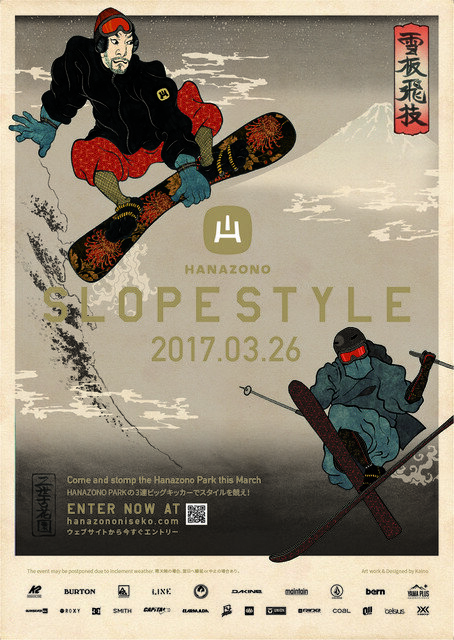 HANAZONO Slopestyle will be held on March 26, 2017 at HANAZONO. Three big kickers will be built on the lower half of the Hanazono Park. It will be an exciting day to see a huge group of skiers and snowboarders congregated together to battle for the numerous prizes! Online registration for HANAZONO Slopestyle 2017 is now closed. Walk-in entry at HANAZONO 308 tomorrow (March 26th, 2017) is welcome! 2,000 JPY for online registration to be paid at the counter on the day of event. Lift ticket is not included in the entry fee. It can be purchased on the day of event. Online registration starts from February 26 (Saturday) - March 25, 2017 (Saturday). Online Registration closes on March 25, 2017 at 17:00 pm or when we reach 80 participants. We accept walk in on March 25th only if spots are still available. All entrants must be able to ski or snowboard in a controlled manner. Helmet is required. Helmet rental is available at 1,500 JPY. There is no age limits. However, minors (under 18 years old) are required to bring the signed agreement form if unaccompanied by parents. ※The event may be cancelled in case of bad weather.